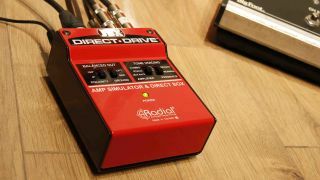 Announced back at Winter NAMM, Radial Engineering's JDX Direct-Drive is now available, and promises to be seriously useful for any gigging situation where you need to pack light, adding guitar amp simulation to the soundman-favoured cab-sim format. The classic JDX cab-simulated sound is based on a Shure SM57 in front of a Marshall 4x12, while the amp modelling side emulates either a Marshall valve head or Fender Twin combo, further adjusted via a presence switch. Connections span an input, passive 'thru-put' (should you so wish to run an amp as well), while a 1/4" guitar-level and balanced XLR output the DI/modelled signal - meanwhile, 180° polarity reverse and ground lift switches are on hand to solve phase and ground loop problems. Should be a handy tool for front-of-house sound and small gigs. The Radial JDX Direct-Drive is available now for $199.99.